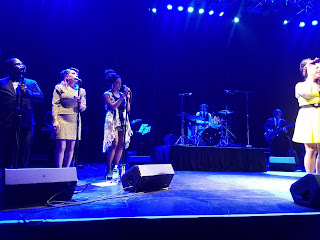 The first half of the show featured several songs from Frank (Winehouse's "other" album) and a few miscellaneous B-sides. Then the stars aligned for the wonderful performance of "Back To Black", in precise order from the album, start to finish. Finally, the group came out for two encores - the spirited "Valerie" and then the ensemble leading the audience in "Amy, Amy, Amy". How do you solve the problem of handling Winehouse's massive vocal range? The innovative solution here was to have six different singers rotating in and out throughout the show, each bringing their own sensibilities and life experience to the task. After each song, a new "Amy" came out for the next one. The first Amy to take the stage was Ginger Coyle. She looked (and dressed) the most like Amy. She truly shined on "You Know I’m No Good", possibly the highlight of the evening as she writhed on the floor just in front of us in the front row. She also performed "Our Day Will Come", "Mr. Magic (Through The Smoke)", "Best Friends Right", and "Tears Dry On Their Own". Her attitude was spot on. Next was Imani Roach, whose songs included "Just Friends", "October Song", "Stronger Than Me", and then closing out the show with "Addicted". Along with Williams and Poland, she was most spectacular when doing background vocals, which she did throughout the show. 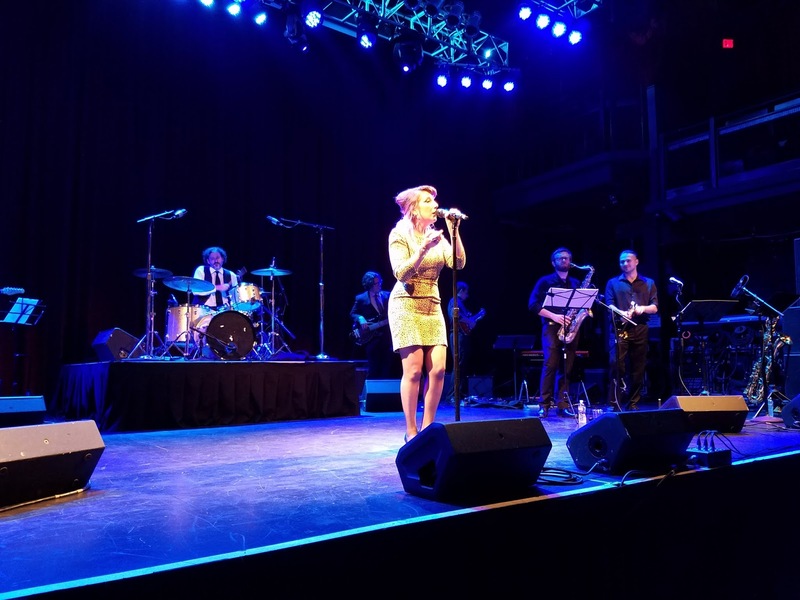 Allison Polans formed the backbone of the show, performing the titular "Back To Black", as well as "Valerie", "What Is It About Men", and the heartbreaking "Love is a Losing Game". She handled the lower registers of the Winehouse ouevre with great skill and emotion. Ryan Williams stepped in for two of the earlier songs, "Will You Stil Love Me Tomorrow" and "F*** Me Pumps". He was outstanding, even though he did not sport the thick corner-flared eye liner of the other Amys. Martha Stuckey (who also performs with the band Red 40 & The Last Groovement), was a bit out of place as she had more of a Kelly Clarkson vibe, lacking some of the coolness of Amy that the others brought to the stage. However, she delivered good vocal performances on the gritty "Take the Box" and "Me & Mr Jones". The low point of the show was Ginghy Miles. She began with "In My Bed", resulting in a hot mess which she could not keep up with. The band played on adroitly, and Miles jumped in and out when she could grab on. She apologized at the end of the song, and said she would get the next one. But then she had similar struggles on "Cherry", which she actually stopped at one point and re-started from the beginning. Fortunately, she managed to make it all the way through "Rehab", which is good since for the casual fans in the audience this is likely the only song of the evening that they would recognize. If I could have added anything to the show, it would have been great to hear this crew take on "Monkey Man" or "Between the Cheats". But they certainly covered all of the essential songs. Since Amy only released two albums, this show was able to cover almost all of her work in two hours time. Among the band, Meltzer was fantastic on drums. He effortlessly played through all of the jazzy tempo changes and the multitude of performers. Also standing out was Finn on keyboards. Of course an Amy Winehouse show is all about vocals, but the entire band was excellent as well. In summary, on behalf of the audience I would like to thank all of the above performers for putting this show together and taking it on the road to the DC area. It was a true pleasure to witness, and I would look forward to seeing it again if they are able to keep it going in Philly. I think Amy would have been proud of this tribute to her, and if she were in the crowd she would have certainly grabbed several stiff drinks and sang along. Pro Life. Pro God. Pro Gun.